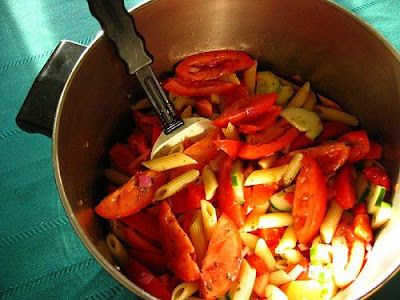 We're still in summer pasta salad mode here at Casual Kitchen, and today I bring you another healthy, easy and inexpensive pasta salad recipe to try. It's been a staple in our kitchen for years. 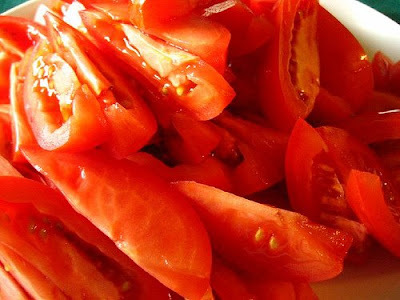 1) Combine the chopped tomatoes, olive oil, basil, vinegar and salt and let stand for a few minutes in a large bowl. 2) Cook the pasta. 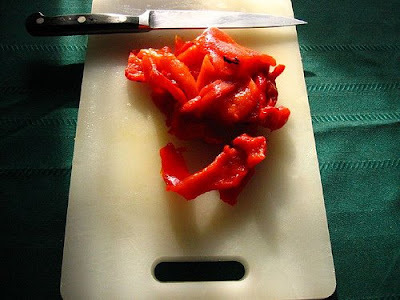 While the pasta is cooking, chop the cucumber, onion, and roasted red bell peppers. 3) Combine everything and mix well. Can serve immediately (while the pasta is still warm), or can serve chilled. 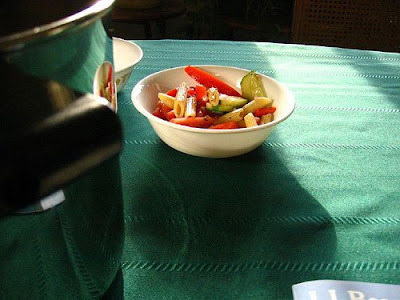 Along with last week's Chickpeas, Pasta and Tomato Salad, our Thai Pasta Salad recipe and today's Penne Pasta Salad, Casual Kitchen now offers three simple and delicious summer pasta salad recipes. Try them all and let me know what you think!